Everyone of us may have a certain way of preparing for a vacation trip. But things do not always go by the book because every destination may have its tricks. Since Santorini may be considered as a more unique destination than others, we thought we should give you some tips. After deciding that you wish to visit Santorini for your vacation, you should start checking out in which village or area you whould like to stay. This is important because the prices in hotels vary quite a lot. As you might know, the most famous and beautiful villages that are built on the west side of Santorini, with caldera (the volcano area) view, are Oia, Imerovigli, Firostefani and Fira (the capital of the island). The first two are the most expensive areas in Santorini, but you should also know, that those are considered as the most beautiful villages not only in Aegean Sea but also in Mediterranean. If your budget is limited, you should be able to find quiet economical accommodations in Oia, if you start looking before January. In Imerovigli however, economical hotels are almost out of the question. Hotels in Firostefani to Fira that are built on the cliff side, are cheaper than in Oia and Imerovigli. There are also a lot of hotels on the east side of Fira which are not as luxurious as others might be, so the difference in rates is enormous. You will be able to find a price that does not exceed 100€ per night in high season. If you are interested in a hotel with caldera view, but you would like to pay lower rates, you should choose Akrotiri village. Especially if you don’t mind staying little bit far from the capital of Santorini. Akrotiri is located on the southwest part of the island, near to the archaeological site. During high season you should be able to find rates from 120 per night with caldera view. Now, regarding other villages that you can choose to stay in, like Pyrgos, Megalochori, Finikia, Kamari or the area of Perissa, you will also find luxurious accommodations as well as studios and rooms to let. Kamari and Perissa surrounding area are costal settlements. The prices there are even lover and you can book a luxury room for 200€ in high season and a studio or a simple room for 60€. After you do your research regarding hotels rates, you have to estimate the budget for your vacation. You should be familiar with some prices of key things you will purchase while you are in Santorini. First of all, the local bus ticket. This will cost you around 1.8 per person, one way. To enjoy coffee with caldera view in one of the cafes, you will pay about 6€ for one coffee plus 1€ for a 500ml water. Cafes that are located inside the alleys or at the other side of a village (without caldera view) are cheaper, about 3.5€ per coffee. Cost of a dinner with caldera view in one of the restaurants will cost from 20€ per person, and can get even to 200€, depending on the restaurant and the dishes, as well as on your drinks. In this case, the same rule applies, without caldera view, your dinner will be cheaper. Wine tour is also something you should do in Santorini. Our island is well known for its unique wine that can be produced only here. During the wine tour, you will taste some of the Santorini most famous varieties, learn about our vineyards and history of wine producing in Santorini. The cost of a wine tour varies, but it is estimated to be around 70€. Organize your itinerary before you get to Santorini. If you are visiting Santorini for just a few days, you have to be organized in order to experience our island. There are so many things you can see and do, while the time is limited and precious. For example you won’t be able to visit the volcano and Akrotiri archaeological site in one day… Organize your schedule so that you visit the places you like to see but at the same time don’t forget that you are on vacation and relaxation is required too! This is quite important. 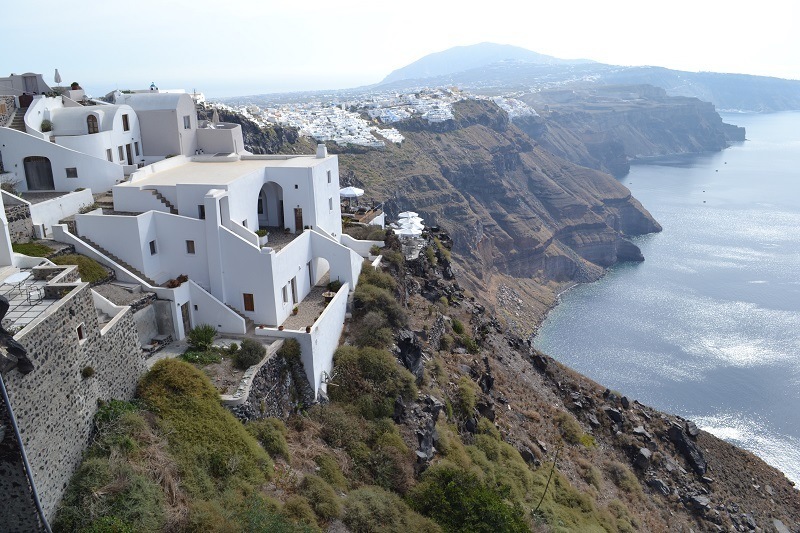 The villages that you will definitely visit, like Oia, Imerovigli, Fira, are built on steep cliffs. That means that you will have to climb many stairs in order to explore them properly. Don’t get us wrong! You don’t have to be a professional athlete to explore Santorini! But if your fitness is at a certain level, your tour among alleys will be more pleasant. Don’t forget to have a hat with you, just in case.